With the release of HD 6000 series, AMD has also revealed a morphological aa technology that not only works with the latest GPUs, but also HD 5000 series. Basically, it is a post-processing effect that improves image quality, reduces aliasing and best of all: it can be applied to all games and has no significant performance hit at all (just a few FPS). Well, we’ve heard that NVIDIA was “pleasantly” surprised when AMD introduced such technology. According to our sources, they are working on a morphological anti-aliasing alternative that should match AMD current offerings. 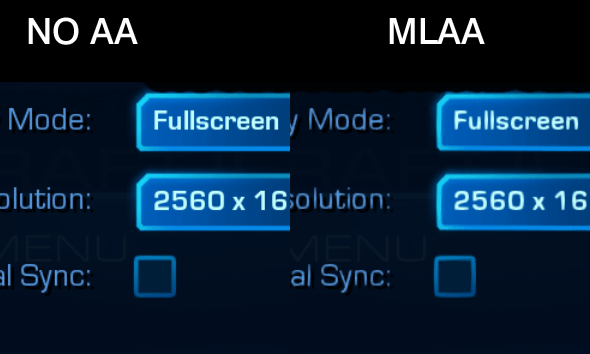 However, if NVIDIA pulls this off, there is one significant difference: unlike AMDs MLAA, it should not smoothen in game text aka make ir blurry (see picture below). As it’s currently in somehow early planning stage, who knows when can we expect and whether NVIDIA can pull text trick off or not.